Well executed B2B telemarketing provides a massive range of benefits in addition to immediate sales leads and appointments. Niall Habba explains in practical terms how to ensure your campaign also delivers these highly valuable “secondary” outcomes, including prospect profiling, lead nurturing, market insight and stalled lead reactivation. 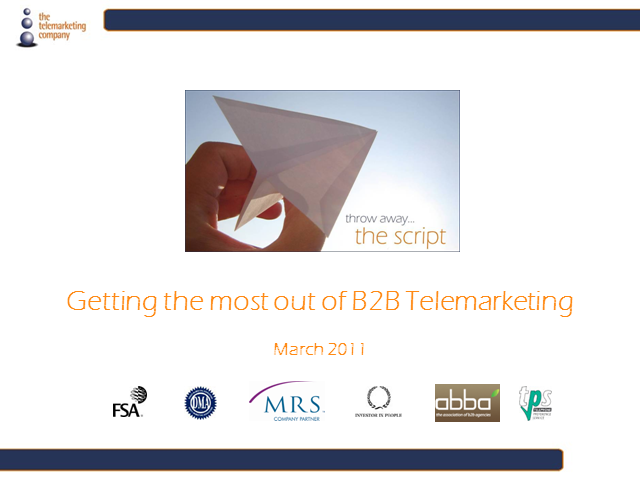 This webcast provides practical steps and actions to help B2B brands make the most of this valuable but sometimes under-utilised resources, as well as avoiding common pitfalls, and how best to work with an outsourced service provider as part of an integrated marketing programme.